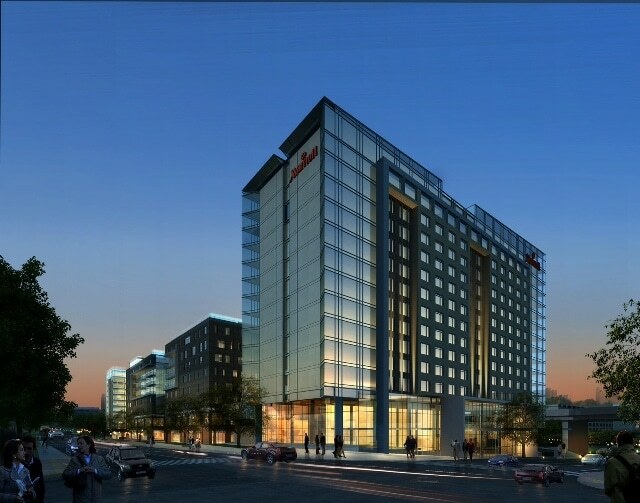 Marcus®Hotels & Resorts, a nationally recognized hotel owner and management company and division of The Marcus Corporation and Shamrock Development, Inc. a leading Nebraska-based development company, today announced that construction is underway and on schedule for the completion of Omaha’s Marriott Capitol District Hotel in late 2017. In addition to the hotel, the $205 million Capitol District will include 218 luxury residential apartments, Class A office space, a 525-stall parking garage, and 90,000 square feet of retail space for restaurants, shops and entertainment, all located around an active, state-of-the-art plaza area that is a contemporary, modern day town square. The plaza will be a primary space for citywide events and concerts, and will serve as a connection point to residential, retail and other uses in the Capitol District. The new Capitol District is located in the heart of downtown Omaha across the street from the CenturyLink Arena & Convention Center and TD Ameritrade Park, home of the NCAA College World Series and other major NCAA and regional events. As part of the development, the new Marriott hotel will have 16,500 square feet of flexible meeting space with an additional 16,500 square feet of pre-function space. The 11,000 square-foot ballroom will be one of the largest among the downtown Omaha hotels. Marriott Rewards Members with Gold and Platinum Elite standing, will also receive access to the exclusive Marriott Club Level and Lounge. Other features and amenities include hospitality suites, a roof top swimming pool with bar/entertainment area, a full-service restaurant, two bars, coffee shop in the lobby, extra-large fitness center overlooking the pool, a parking garage and personalized concierge service. Omaha was rated “One of the 10 Best Cities for Millennials Right Now” by the Atlantic Wire and is committed to bringing the next generation of talent into the city. “This is a great time for this type of new development and will further enhance Omaha’s appeal as a great city to work, live and play,” added Moylan. Marcus Hotels & Resorts is a minority investor in the project and will manage the 12-story high-rise hotel.